Distributor: Currently licensed by Right Stuff International. The Angels are a branch of the military that specialize in mercenary-type missions, and they accomplish these with sugary cuteness and random insanity ... ... that's it. One thing that most non-Japanese find difficult to understand is the Japanese people's love for sugary cuteness. We've seen it all, from Hello Kitty to SD Gundams - anything small, colorful and usually helium-filled draws crowds of fans dressed in tacky designs and wearing "I LOVE ENDLESS TOGETHER OF SUMMER" bags. It's certainly something worthy of scientific research; and if this was the subject, Digi Charat would be the thesis. Broccoli tossed that Overlord of insane-cute onto the loving masses and its immense popularity baffled many to no end (including our own Editor-in-Chief). 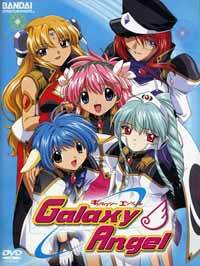 Enter Galaxy Angel. Probably realizing that too much random insanity would cripple the future leaders of Japan (in the same way that Animaniacs has done us irreversible damage), Broccoli came up with something more subdued - kinda like Digi Charat after years of medication and psychotherapy. The Angels are made up of five girls, each with a distinct personality. We have the oh-so-innocent Milfeulle, who has a heart of gold and incredibly good luck. Then there's Forte, the veteran markswoman; Mint, the cute Digi Charat clone; Ranpha, the beauty-obsessed athlete; and Vanilla, the silent servant of religion. This unusual band of characters take up special missions for the military, and these are shown in short 10-minute segments (2 per episode). There isn't any relation between the segments, and the plots range from comedy, serious to the mindnumbingly insane. Usually, the missions start off in a straightforward way, like the Angels stopping by an island with Mint going to the top to see the view. She gets her head stuck in a cardboard picture, and not wanting to be made fun of by her fellow team members, she tries to keep them away from the top by guiding them all over the place as the island starts to sink. This, of course, being one of the saner episodes in the line-up. The randomness of the segments' plots is proven by the length of this review's synopsis, and the fact that AXN-Asia couldn't pin a story on it for their ads, making up something about "protecting the hidden temples" which is obviously a gross summation of the title. Think of it as a fiendish product of Murphy's Law and Digi Charat: "Anything that *can* go wrong-nyo, *will* go wrong-nyo". Even the visuals are bright, colorful and happysugarydiabetic, but surprisingly don't lack in quality. I've seen titles with the animation budget wasted on buying more pastel colors for the art guys, but for a randomly insane title like this the animation is generally consistent. In fact, they even had the cash leftover for some CG, but it was usually wasted on unimportant stuff in most of the scenes. One disadvantage of having a bunch of filler episodes strung together to make an anime is that plot development is almost non-existent. There are episodes that focus on individual characters' pasts, but usually there's nothing to entice you to watch the next segment unless you're hopelessly low on blood sugar. Some segments also make absolutely no sense (like say, half of End of Evangelion), but in this case I seriously doubt there's some implied philosophical meaning behind it all (barring some alien conspiracy to cripple Japan's youth). It actually started out quite fun for me, and the way they played on Milfeulle's incredible luck was highly amusing. As the show soldiered on, I slowly began to lose interest as the random insanity somehow began to seem...normal (subliminal desensitization, I suppose). The introduction of Nomad, the wandering missile AI (please, don't ask) first seemed like a good idea, but later its voice, actions and mere EXISTENCE began to drive me to screams of frustration (as it did to Forte). The greatest surprise of all was not the animation or the plot, but the music. You would expect a title like this to have a squeaky hyper opening song and an equally annoying one to end with, but *surprise* - the song "Galaxy Bang! Bang!" is actually quite fun and the seiyuu who sing it aren't too screechy or helium-powered. It contains the randomness of Excel Saga's OP, the fun of Full Moon o Sagashite's OP, but the happyhappycute of Hand Maid May's OP. Galaxy Angel-related music CDs continue to sell in Japan (especially with the introduction of the recent PS2 game) and that shows that this combination of seiyuu is a good one for the music. Galaxy Angel is sugary, random and insane - go for it only if you need some mindless entertainment, but THEM will not be held responsible for any side effects or asylum sentences arising from repeated viewings. Recommended Audience: There isn't any objectionable content as far as I can remember, so showing this to kids will be no problem. The random insanity is on par with just about anything on Cartoon Network's line-up, but the sugary cuteness might mess up a child permanently.